It all started on New Years day in 1998. What a great way to start a new year... by finding alpacas. Tired of the big city, terrible pollution, and a 2 hour commute every day for work, I pondered how to live a better life. There was my nice cul-de-sac home with three-car garage that seemed to be the perfect place to reside, but it took working long hours to pay for it. Consequently, the 'dream life' in the cul-de-sac proved counter productive, as I was always working and never home. Three daughters were growing up fast and I just dreamed of a little house on a piece of land where we could live a simple life and maybe grow something...like a farmer. Always a gardener, I dreamed of what type of crop I could farm. I had already purchased some books on growing lavender, flowers, mini-vegetables (they were the rage at the time) and other interesting and rare crops. However... Inside a Sunset Magazine that I opened that fateful day there was an advertisement in the back with a picture of a very cute, fuzzy white face. It was, of course, an alpaca. The face was smiling it seemed, and I could not believe there was such a creature. I had never heard of an 'alpaca'. We researched a little online, and found there were a few in Arizona. To make a very long story short (and trust me, it was the most difficult and ill-planned alpaca start-up you could imagine) there was a divorce, and a single mom who took the road less traveled. It has made all the difference. We purchased one female weanling to start, and boarded her at a nearby ranch. We built a little house on the prairie with my family's own hands and settled in. Life was good. It occurred to me that it was simply p e a c e f u l ~ not that there weren't hard times or difficulties, there were many. There was lots of hard work. The things that were once taken completely for granted, like running water, became precious. We did without a lot, but there was clean air and a beautiful view... there was peace. I'd like to say that is our 'story', but its not finished... we're still working on the ending. Our story is one that we are proud of, and content with. We're not quite sure if it's a comedy, drama, or horror - as it seems every day has a little bit of each... but, whatever happens in the end, we are sure its a best-seller! 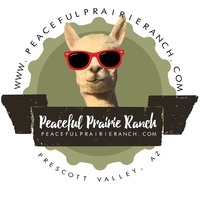 Peaceful Prairie Ranch encompasses 10 acres of Arizona 'Altiplano' (High plains) that is home to a few humans, 2 Labs that faithfully guard the place, 4 cats that think they own the place, egg-laying chicks, about 80 alpacas and 7 Merino sheep from champion bloodlines. My oldest daughter has completed Grad. School (wow!) and lives in SanFrancisco, the 'middle kid' has a Bachelors from NAU, and is a professional photographer who travels the world and happily resides in Seattle. The youngest is the best barista in the world, lives in Tucson and at least has chickens in her yard... While they did not carry on the wool-growing tradition of their mom, I can attest that raising them up on a farm certainly helped 'launch' them into strong, smart and capable women. In 2017 Wendy married her love, Dusty Eiker, after 14 'exciting' years together. 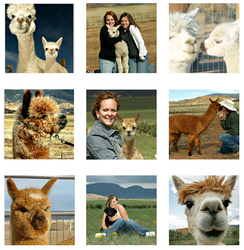 Together they have run Level III Alpaca shows and have attended hundreds of shows and events in our industry. Dusty's completion of grad school with a degree in environmental policy brings his vast knowledge of the biological side of grazing, ecosystems and sustainable farming to the team. in 2016 we grew our first indigo crop that he planted at the farm. This farm is unique in that I started very small and on a shoestring budget. 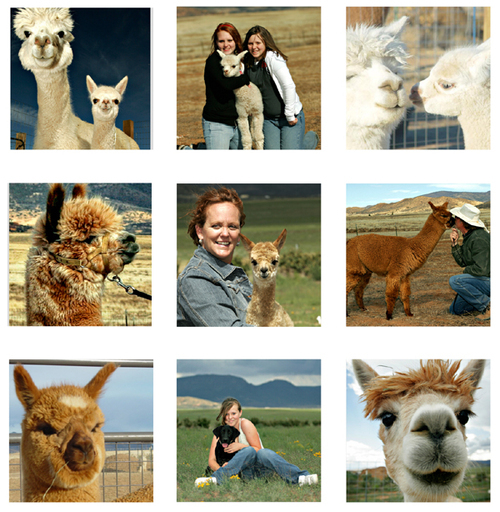 We have grown slowly, and are living testament to the fact that you can start an alpaca ranch in this manner and let your business grow slowly along with your knowledge and involvement in the industry. You don't have to be rich. But you have to be focused and work smart. We have persevered during market downturns and remain strong in our business plan. We feel there are many avenues to 'getting into' the alpaca industry and doing well, not just one model. 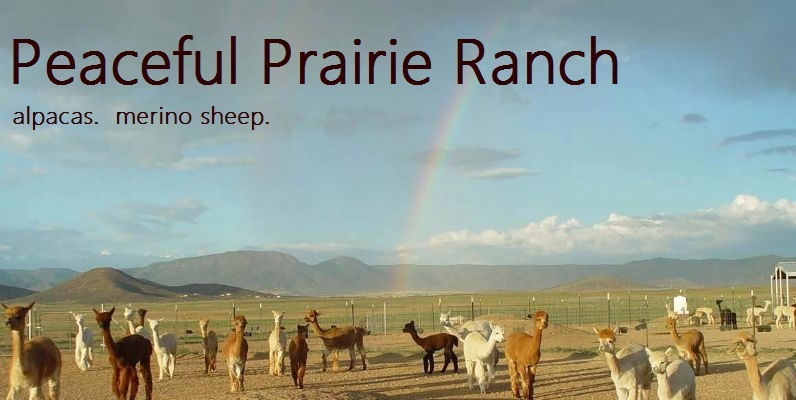 At Peaceful Prairie Ranch, you will enjoy an honest and down-to-earth approach at the raising alpacas for business or pleasure. You can adopt pets, purchase inexpensive, yet exquisite fiber animals to raise for your own fiber arts, or even purchase champion bloodlines to start a breeding program and farm of your own. You will also receive support from us before, during and after all sales. As for the alpacas themselves...well, they're awesome!